5793 labyrinths found. Showing 4781-4800. Sorted by country, state, city, then zip/postal code. 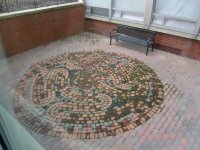 The labyrinth is outdoors in front of the library. The labyrinth Study Circle was a gift of the Class of 2009. Chartres replica on canvas, path is painted with green leaf-like strokes. Holy Week, 9:00am-9:00pm, by appointment. Other special events throughout the year, call for availability. 1. Follow Philadelphia Street from the center of town to the east end. 2. Continue straight ahead onto East Pike & go 1/2 mile. 3. Turn right onto Twolick Drive & go 1/2 mile. 4. Turn left onto the church lot. 5. Walk behind the church to find our labyrinth. NOTE: the labyrinth is currently under reconstruction, so will be temporarily unavailable - check back soon for news of re-opening. 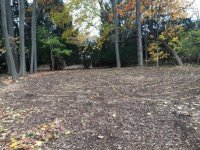 Two labyrinths available - one outdooors in the church courtyard and one portable - call Annis for availability of the portable labyrinth. located within the Memorial Garden next to the Church and open to all. 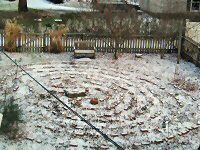 This outdoor labyrinth is part of my private gardens. I am happy to accept visitors, even small groups, if prior arrangements are made. Within Lancaster city. Street parking. Dedication of St. John's labyrinth, May 11, 2018. 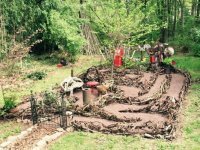 This community labyrinth is on church property but is in a courtyard that's accessible to the public 24/7, and everyone is welcome. The only exception would be during an interment service at the columbarium that surrounds the courtyard. Enter through archway to the left of the front yard. Pathway leads to labyrinth. Exit down driveway. Labryinth is in church picnic grove, across the street. Anyone may visit during the daytime; please leave the place as you found it! Enjoy! Route 183 north of Reading, turn right onto West Leesport Rd. Epler's church is on the right, and the cemetary is just beyond the church. The labyrinth is at the back of the cemetary at the end of the entrance lane. The 7-circuit classical labyrinth is painted on the floor of the pavilion located behind the church. 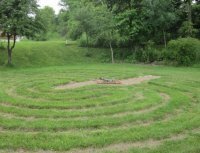 The Spiritual Wellness Center at Saint Francis University includes a labyrinth, outdoors in a sunken courtyard between the DiSepio Institute and the mall, and an indoor meditation room offers individuals and small groups an opportunity to meditate and pray.